A smoke detector or smoke alarm is a safety device that senses and detects the presence of smoke in a structure and warns the occupants of the possibility of fire. They are easy to install and are very important for the protection of your family and home. According to the US Fire Administration, “installing a smoke alarm on every level of your home will significantly decrease the chances of a resident dying in a fire”. During a residential fire, smoke and dangerous fumes will often spread faster than the heat or flames. Most fire victims die from the inhalation of these toxic fumes when they are asleep, not from the fire itself. About two-thirds of residential fire deaths take place in homes where there are no smoke alarms or have non functioning smoke detectors. Properly installed and maintained smoke alarms are considered to be one of the best and least expensive ways of providing an adequate warning during a potentially deadly fire. There are two types of smoke detectors that are offered to homeowners. They can either be battery powered or hard wired into the power supply of the home. Photoelectric Smoke Detectors – Uses a special optic sensor to detect smoke particles. If the optics are disrupted or lessened to any degree by smoke particles, the alarm will trigger. Better at detecting smoldering fires with larger particles. 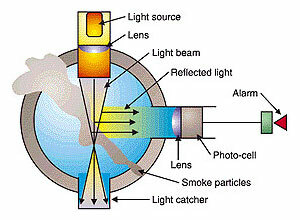 Ionization Smoke Detectors – Emits minute amounts of radioactive material (Americium) in a small chamber of the detector, creating an electric current. If a fire is present, and the current is disrupted within the chamber, the alarm will trigger. Better at detecting smaller particles. Dual Function Smoke Detectors – Unfortunately, no one can predict the type of fire a home may have. This type of detector utilizes both photoelectric and ionization methods and is considered the best you can buy since it will detect more kinds of fires faster. For the best protection, this type of detector is recommended since it utilizes both technologies. The alarm must must have the ability to sound an alarm of at least 85 decibels for 4 minutes. The batteries must be able to last for at least one year. 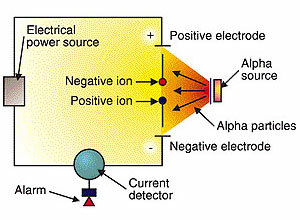 The detector must give a distinct audible signal if the batteries are low or the device has some other type of problem. The detector must have the capability of still producing an alarm in this lower power or troubled state. Battery-operated smoke detectors have a distinct advantage over hard wired units. That is, if the power goes out, they will stay active. They are also cheaper and more convenient to install. These advantages will only stay in effect if the batteries are replaced in a timely fashion each year. Hard-wired detectors should be interconnected so if one sounds, they all sound. This gives occupants extra time to escape if a fire should occur. Smoke alarms that are hard-wired should contain a battery backup. They should also be installed by a qualified electrician. Deaf and hearing impaired occupants should consider smoke alarms that combine a strobe light and vibration along with sound. wall. Wall mounted units should be 4″-12″ from the ceiling. Pitched ceilings should have detectors placed at the ceilings highest point. Smoke alarms shouldn’t be placed anywhere where interference may occur, such as windows, doors, or ducts. Do not paint smoke alarms. Any decorative additions can keep the detector from operating properly. The most important thing about smoke alarms and detectors is that they save lives. Keeping them maintained and functioning properly should be at the top of every home safety list.